Our African Walkabout allows you to experience the West Coast of South Africa, Namibia, Botswana and Victoria Falls in Fish River Canyon, Sossusvlei, Swakopmund, Himba Tribes, Etosha National Park, Okavango Delta, Western Caprivi, Chobe National Park & Victoria Falls. The West Coast of South Africa stretches over 400 km from south to north and under normal conditions we shall see the spectacular carpets of wildflowers of the famous Namaqualand region. 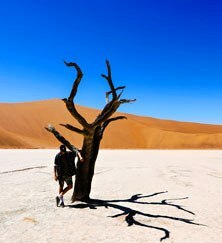 Namibia is situated on the Atlantic coast of Africa but the general landscape is dominated by the oldest desert in the world, the Namib. The surrounding areas are dry and visually impressive, with interesting flora and fascination geological formations. 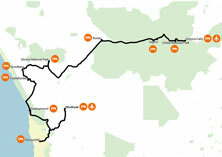 In Namibia we come "face to face" with lots of big game - elephants, lions, giraffes, zebra etc. It is very special seeing these wild animals in their natural habitat. 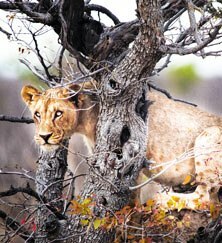 Botswana is known to be hot and dry, with the exception of the lush oasis of the Okavango Delta - reputedly one of the most beautiful places in the world! 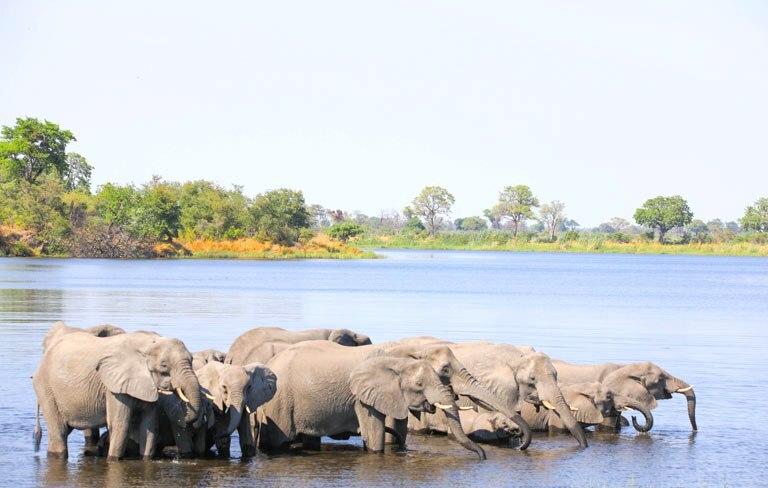 Largely off-the-beaten track, Botswana is a haven for wildlife - especially elephants. Victoria Falls is the largest waterfall in the world, making it one of the world's "Seven Natural Wonders! In the 1800's Victoria Falls was described by the nearby Kololo as 'Mosi-oa-Tunya' which means "the smoke that thunders" - illustrating the powerful forces of Victoria Falls! David Livingstone is believed to be the first explorer to have discovered Victoria Falls; in 1860 he spread the word about his travels there. The area soon became a popular tourist attraction, especially on the Zimbabwean side. Our accommodation includes permanent camps, bush cabins, chalets in a Reserve Park and the luxury of an Eco Lodge on the edge of Africa's highest sand dunes. Most of our meals are at our lodges but sometimes our guides prepare our dinner on the campfire and we dine under the stars - with a dazzling display of the southern hemisphere night sky. Great trip. Surprised, especially by Namibia. Vast deserts, long roads, few people. And the animals! Really well looked after, realising how long some of the days were. Everyone remained calm even after hours of corrugations, dust and desert. Dry river beds. Startling horizons and outstanding sunsets. People seemed at least happy and yet there was no doubt they were poor in our terms. Ian and I thoroughly enjoyed the experience of being in the wild with the most exotic animals in the world. 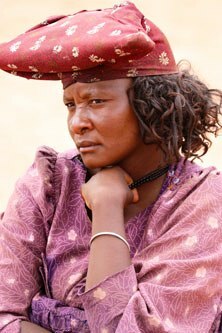 We were not impressed by the township of Swakopmund and also the Himba Tribe. We felt a little intimidated. All other accommodations and national parks were magic. Seeing our first springbok and then giraffe and elephant, so exciting. Lots and lots of photos were taken. 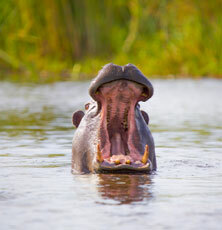 The Hippopotamus made an impression on us, watching them poke their ears and eyes out above the water as if to say, Hello! We loved the journey with Graeme and Pine our guide. The fabulous suggestion of Walkabout Gourmet taking on a project to ensure clean water to the school we visited while staying at the Kaisosi River Lodge, hopefully will be launched. Graeme and guests appeared very enthusiastic. Thank you and enjoy the journey.